Snooper Truckmate SC5700 DVR is the first sat nav to feature an integrated Digital Video Recorder (DVR) for recording events and incidents along your journey and the Truckmate is specifically designed for use in Lorries and other large vans and large vehicles. The SC5700 includes a 5-inch touchscreen, Bluetooth for handsfree calls and provides FREE TMC Traffic information. The SC5700 also includes MY SPEED XL which enables the screen to show only the speed limit and your speed. Snooper SC5700 DVR Truckmate has been discontinued. The Snooper SC5700 DVR Truckmate has been replaced by the Snooper SC5900 DVR Truckmate. Snooper S5700 DVR Truckmate is a portable 7-inch satellite navigation system which has been designed for drivers of trucks, HGVs and other commercial vehicles. ‣Snooper SC5700 DVR Bus & Coach - for drivers of coaches and buses. ‣Snooper SC5700 DVR Truckmate - for drivers of trucks, HGV's and oversized vans. ‣Snooper SC5700 DVR Ventura - for drivers towing caravans or driving a motorhome. ‣Snooper SC5700 DVR Syrius - for drivers of cars and small vans. Please note: All of the above Snooper SC5700 DVR models feature a car mode. The SC5700 DVR Truckmate sat nav features a bulit-in High Definition (HD) in-car camera, also known as a Digital Video Recorder (DVR). The SC5700 DVR video camera will automatically record any traffic incidents along your journey. Additionally, there is a microphone that will record sound inside your vehicle. The DVR can also work with the GPS technology in the device. It will record location of incidents that have occurred, time, date and the vehicles speed so you have crucial information to provide for insurance purposes. The video can then be downloaded to your PC to view back any incidents that have occurred during your journey(s). The plug-and-play SC5700 DVR can be transferred from truck to truck in seconds and what's more if you're driving different trucks you can save up to 10 different truck profiles! Plus at the press of a button there's also a car mode too. The Snooper SC5700 DVR truckmate sat nav features a large 5-inch touchscreen, Bluetooth and built-in FM transmitter. The Truckmate SC5700 uses the latest here mapping and is available with either preloaded UK and Ireland or European maps. SC5700 truck sat nav also provides advanced warnings to roadwork's, congestion and traffic jams and what's more these alerts are all FREE. The SC5700 features TMC Traffic information which utilises the traffic master information network. The Truckmate 5700 works like a normal sat nav; you enter the address, postcode etc, for turn-by-turn directions to your destination. What makes it very different is that you can enter and save your trucks load, height, weight, width, length and the Snooper truck mate's preloaded software will then calculate the best route avoiding low bridges, unsuitable and too narrow roads, etc. Snooper SC5700 DVR Truckmate truck sat nav is the result of more than 5 years of development of the Snooper truck mate range. Research has shown that truckmate users will save money over time. By using Snooper satellite navigation to find the shortest or most economical route you will save 16% fewer miles driven on each journey and thus also a 16% saving in fuel expenses making this Snooper Truckmate pay for itself. Read more about Snooper Truckmate click here. SPECIAL OFFER: Buy the SC5700 Truckmate or any other Snooper truck sat nav model from ActiveGPS and receive FREE lifetime map updates worth over £100. The annual road map updates are by here. Details of the offer and other models that include the FREE lifetime map updates are available via the following link. 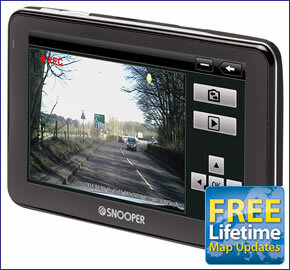 Snooper Truckmate SC5700 Pro truck sat nav on-board features include Junction View and Lane Guidance. These features make it clear what lane you need to be in at each junction providing you with plenty of warning. To make your current location clearer and to highlight where you are heading this truck sat nav can also increase the size of road names and numbers displayed on the 7-inch screen. The Snooper SC5700 has a point of interest 'corridor' search which will inform you of points of interest along your predetermined route. Additionally the SC5700 sat nav system includes AdBlue Filling Station Points of Interest. This feature allows you to find your nearest petrol station. There is also a route timer that can be set to alert you when it is time to take a break on your journey. Truckmate SC5700 DVR also includes MY SPEED XL a first on any Snooper sat nav information meaning it will tell you the speed limit of every road regardless of whether there is a speed camera there or not. This information can be soley dispalyed on the screen making it very clear what speed you are driving at and the roads speed limit. You can get speed limits for lorries over 3.5t too. The Truckmate SC5700 will also alert you if you exceed the speed limit protecting your driving licence. The Truckmate can also be optionally updated to include Snoopers’ Aura Database of speed camera locations.Click here to read more about the AURA speed trap database. Snooper SC5700 DVR Truckmate mounts on the inside of your vehicles windscreen using the suction cup windscreen bracket provided. Snooper SC5700 Truckmate can be powered directly either from its internal battery if it's fully charged or powered from the cigarette lighter socket. UK • Ireland • France • Spain • Portugal • Italy • Austria • Switzerland • Belgium • Holland • Luxembourg • Germany • Denmark • Norway • Sweden • Finland • Poland • Estonia • Lithuania • Czech Republic • Latvia • Liechtenstein • Hungary • Romania • Slovakia • Slovenia • Serbia • Montenegro • Croatia • Turkey • Greece • Albania • Bosnia & Herzegovina • Bulgaria • F.Yugoslavia Rep.of Macedonia • Russia. Snooper SC5700 Truckmate provides advanced warning of all fixed speed cameras, SPECS and many laser sites using Snooper's AURA speed trap database. There are 3 easy ways to pay using a credit or debit card. The Snooper S5700 DVR will only operate on Windows computers. Specifically, you must be using Windows XP (32 bit), Windows Vista, WIndows 7, Windows 8 / 8.1. Additionally the software will only work with Internet Explorer 6 or Netscape Navigator 6 or above. The Snooper SC5700 DVR will not operate when using Windows 95, 98, Millennium, 2000, Windows XP (64 bit) or Apple Macintosh operating systems. The SC5700 DVR Truckmate comes supplied with everything you need to use it in your truck/van/HGV or car (see What's in the box? above), however replacement and additional SC5700 DVR accessories are also available to buy from ActiveGPS. Two Snooper SC5700 accessories that you might like to consider buying is the AC mains charger, enabling you to power and charge your sat nav from the mains, and the sun visor, which clips onto the SC5700 DVR 5-inch screen. View all of the Snooper SC5700 DVR Truckmate accessories here. This product is a sophisticated electronic device which requires that you read, understand, and act upon the information given in the instruction manual (usually available via the above 'manual' link). You will need internet access and, in accordance with the manufacturers’ recommendations, regularly seek out and accept all firmware or software updates offered by the manufacturer. All GPS devices need to ‘see’ the satellites in the sky. Therefore you will need to know that your vehicle does not have glass that will block or impede the GPS signal. ActiveGPS.co.uk (parent company Active Alliance Limited) is an Official Snooper Internet Supplier No: PP1310. The Snooper official Internet supplier network has been created to protect UK consumers from stolen and counterfeit goods. In addition as an official supplier we have the expertise to provide you with the best before and after sales service. For further information please click on the logo to the right. We offer UK, Europe and Worldwide deliveries. We despatch orders at 5.30pm on Monday, Tuesday, Wednesday, Thursday and Friday. We need to receive your order on those days by 4.30pm. When possible we may despatch orders received after that time. No orders are despatched after 5.30pm and no orders are despatched on Saturday or Sunday. We offer FREE UK delivery on all orders of £40.00 or more, plus next working day and guaranteed Saturday delivery options. Click here for further info. All options also appear at the basket pages.